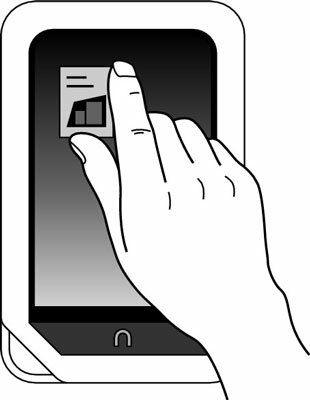 You communicate with your NOOK Tablet using some simple hand gestures. You’ll quickly learn how to get around anywhere you want to go, because the gestures are pretty easy to pick up. In the Daily Shelf or your Library, swipe to move through a collection of items (such as a row of book covers). On the status bar, swiping to the left brings your NOOK Tablet back to the previous activity. When reading, swiping to the left will flip the page forward. Swiping from left to right takes you back a page. Scroll up or down through a list of menu options. Move down or go back up a set of small images of books, book pages, bookmarks, photos, or music tracks. Go through a magazine piece in Article view, zipping through the text without illustrations or photos. Drag to check out additional web search results. Drag a piece of reading material from the Home screen to the Daily Shelf. Drag a slider left or right (or up or down) to adjust things like volume. Zip through the pages of a book by dragging the location slider right or left. Select a phrase by dragging a vertical bar (at either end of a word) until a pair of bars are around it. Drag crop marks to frame the part you want to keep of an image. Drag the virtual green ∩ symbol on the screen (not the physical one on the frame below) to the right to unlock the tablet and display the status bar. 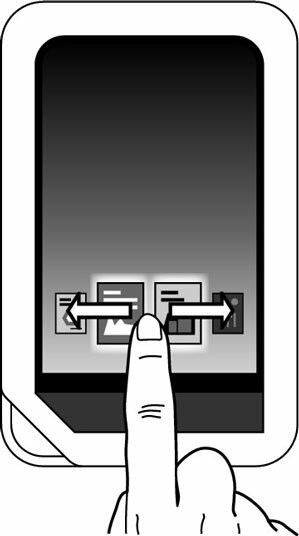 A pinch is where you touch the two fingers on the touchscreen and bring two of them toward each other (or away from each other — aka a pinch out). Most people use their thumb and pointer fingers. Pinch your fingers toward each other to shrink an image — a book cover or a photo, for example. Spread your fingers apart to zoom in on or enlarge an image on the screen. The NOOK Tablet has four physical buttons: switches that you actually press. You don’t tap, swipe, pinch, or anything else — just press. The first is the power button, at the top of the left side. Across the tablet, at the top of the right side, are pair of + and – volume control buttons. The ∩ button sits at the bottom of the screen as you hold it in portrait mode.